Elasticity is a relatively new term, introduced with cloud computing, that expands on traditional notions of scalability. Where scalability focuses on expansion or growth of a resource, elasticity also implies the reverse: the ability to contract available resources. 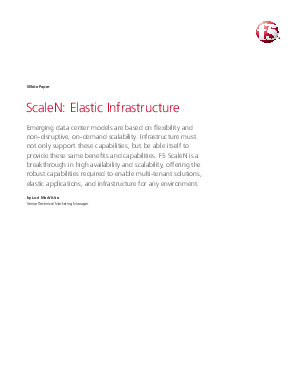 Elasticity is considered superior to traditional scalability because it attempts to exactly match resources to demand. Doing so eliminates costly over-provisioning methods used in the past, which ensured the capacity to meet sudden spikes in demand, and improves utilization for a better return on investment. While elasticity as an operating and business model initially focused on applications, it has become evident that infrastructure services like load balancing and identity and access management must also be elastic. Applications are not islands and cannot properly adapt to demand if the services upon which they are dependent do not also expand and contract to meet demand. This paper takes a closer look at a ScaleN technology that offers a more efficient, elastic, and multi-tenant approach to meeting the challenges and demands of modern data center architectures. It also discusses the ways in which elasticity can be achieved and how it offers multiple scalability models to better meet the sub-second failover and on-demand scalability required by modern business and IT organizations.